In a mouse model of methotrexate chemotherapy-induced dysfunction, researchers found that oligodendrocyte precursor cells (OPCs) were depleted in white matter, leading to a persistent deficit in myelination and cognitive deficits. Feeding the methotrexate-exposed mice chow enriched with an investigational drug that inhibits colony-stimulating factor 1 receptor depleted the number of microglia, normalized the OPC population, restored normal myelin sheath thickness, and rescued cognitive performance. A cascade of alterations to neuroglia have been observed in postmortem brain samples of both children and mice exposed to chemotherapy, offering one of the first mechanistic explanations — and a potential treatment target — for the cognitive dysfunction sometimes associated with such treatment. In five children and one young adolescent exposed to multi-agent chemotherapy for the treatment of cancer, the density of white-matter oligodendrocyte precursor cells (OPCs) in postmortem frontal lobe tissue was more than 70 percent lower than in age-matched youths who died of other causes, a paper published in Cell on January 10 reported. In subsequent experiments involving mice exposed to high-dose methotrexate, the paper described not only a similar depletion of OPCs but also thinner myelin sheaths and a reduction in the number of mature oligodendrocytes in subcortical white matter. What's more, these changes were associated with the presence of inflammatory microglia, as well as with astrocytes in a state of neurotoxic activation. The paper reported that feeding the methotrexate-exposed mice chow enriched with an investigational drug that inhibits colony-stimulating factor 1 receptor (CSF1R) depleted the number of microglia, normalized the OPC population, restored normal myelin sheath thickness, and rescued cognitive performance. The study, led by researchers at Stanford University's department of neurology and neurological sciences, drew varying reactions. Some neurologists called it a “brilliant” and “exciting” advance in understanding the underlying neural mechanisms by which chemotherapy may cause so-called chemo fog or chemo brain. Others, however, noted that the postmortem brain samples involved relatively few subjects, all of them young, and that the mice studies involved only methotrexate. They pointed out that other factors can also contribute to cognitive dysfunction after cancer therapy, including endocrine effects of the therapy, the stress of diagnosis and treatment, and effects of the cancer itself. The paper in Cell described multiple experiments, beginning with an examination of preserved postmortem samples, collected over decades, from three children and one young adult, each of whom had died of cancer following treatment with a variety of chemotherapies. (None had undergone cerebral radiation.) OPC cells were significantly depleted in the chemotherapy-treated samples (4,150 ± 876 cells/mm3) compared with the four controls who died of other causes (14,893 ± 2,063 cells/mm3), the researchers found. The decrease was seen primarily in subcortical white matter rather than in gray matter. Not all of the chemotherapy-treated children had received methotrexate. But a postmortem sample from a fifth child, who had recently died at the age of 3 following treatment with high-dose methotrexate, revealed a “stark depletion in OPCs in the subcortical white matter,” said the senior author of the paper, Michelle Monje, MD, associate professor of pediatric neurology at Stanford. To test the effect further, Dr. Monje's group developed a juvenile mouse model of methotrexate-induced neurological dysfunction. They observed a depletion of white matter OPCs similar to that seen in the human samples, increased but incomplete OPC differentiation, and a persistent deficit in myelination. Dr. Monje's group sought to answer that question by observing what happened when they transplanted OPCs from methotrexate-naive mice into the previously methotrexate-exposed brains. They found that these OPCs likewise exhibited aberrant differentiation. Seeking next to discern what in the microenvironment was causing the OPCs to grow abnormally, the team examined the microglia and found they became inflamed in response to methotrexate. The Stanford group then exposed the astrocytes to methotrexate, finding no direct effect. But when exposed to the inflamed microglia, the astrocytes became activated into a neurotoxic state. In a final experiment, Dr. Monje's group tested whether depleting the inflammatory microglia might normalize the cognitive test results of the methotrexate-treated mice. They used a small-molecule investigational agent, PLX5622, which previously was shown to eliminate microglia and improve cognitive function in mouse models. As hoped, PLX5622 corrected the tri-glial dysregulation as well as the mice's performance on the novel object recognition test of cognition. Patrick Y. Wen, MD, FAAN, professor of neurology and director of the Center for Neuro-Oncology at Dana-Farber Cancer Institute, concurred. Kerstin Hermelink, PhD, a senior psychologist at the University of Munich, Germany, who has published a series of papers examining the role of chemotherapy in causing cognitive dysfunction in breast-cancer patients, had a different view of the paper, however. In a 2017 paper in the Journal of the National Cancer Institute, Dr. Hermelink and colleagues compared cognitive functioning in breast cancer patients before and after receiving chemotherapy and in comparison to breast cancer patients who did not receive chemotherapy, as well as to healthy controls. The study found only mild cognitive impairment in the breast cancer patients, largely irrespective of whether they had received chemotherapy. Instead, the effect was seen prior to any treatment, mediated primarily by clinically diagnosed symptoms of post-traumatic stress caused by the cancer. Other recent papers have reached similar conclusions about the limited effects of chemotherapy on cognition, including a 2015 meta-analysis of breast cancer patients and a prospective longitudinal study of colorectal patients. Both concluded that the cancer diagnosis itself, rather than treatment with chemotherapy, is the cause of cognitive impairment. Dr. Wen stated, however, that the cognitive effects of methotrexate are known to be uniquely severe, far more so than other chemotherapeutic agents. Dr. Kumthekar agreed that Dr. Monje's paper offers convincing proof of a biological pathway by which methotrexate causes its cognitive effects. “Michelle Monje has demonstrated, in an elegant research model, that methotrexate produces a lasting dysfunction of oligodendrocyte lineage cells, astrocytes and microglia. Importantly, microglial activation is necessary for this dysregulation, indicating a possible therapeutic target,” she said. Drs. Monje, Kumthekar, Rogers, and Wen disclosed no relevant conflicts of interest. Dr. Taylor received royalties from Oxford press for the publication of Navigating Life with a Brain Tumor. •. Gibson EM, Nagaraja S, Ocampo A, et al Methotrexate chemotherapy induces persistent tri-glial dysregulation that underlies chemotherapy-related cognitive Impairment https://www.cell.com/cell/fulltext/S0092-8674(18)31405-3. Cell 2019; 176 (1–2): 43–55. •. Acharya MM, Green KN, Allen BD, et al Elimination of microglia improves cognitive function following cranial irradiation https://www.nature.com/articles/srep31545. Sci Rep 2016; 6: 31545. •. Dagher NN, Najafi AR, Kayala KM, et al Colony-stimulating factor 1 receptor inhibition prevents microglial plaque association and improves cognition in 3xTg-AD mice https://jneuroinflammation.biomedcentral.com/articles/10.1186/s12974-015-0366-9. J Neuroinflammation 2015; 12: 139. •. Hermelink K, Buhner M, Sckopke P, et al Chemotherapy and post-traumatic stress in the causation of cognitive dysfunction in breast cancer patients https://academic.oup.com/jnci/article/109/10/djx057/3795524. J Natl Cancer Inst 2017; 109 (10). •. Ono M, Ogilvie JM, Wilson JS, et al A meta-analysis of cognitive impairment and decline associated with adjuvant chemotherapy in women with breast cancer https://www.frontiersin.org/articles/10.3389/fonc.2015.00059/full. Front Oncol 2015;5:59. 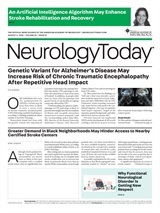 Neurology Today19(3):4-5, February 7, 2019.